Tarot for Change: How to change someone else's behaviour? How to change someone else's behaviour? The quality of life very much depends on ourselves: things can't get better if we don't change them or change ourselves. However, what if your life is less than ideal because of someone else? We've all heard that the only person I can change is myself. But, what if I'm pretty dang dazzling and the other person/people need to change for the issue to be solved? Jokes aside, you don't need to be perfect but you might still be a "better" person than your partner, colleague, boss, parent, child, mother-in-law or whoever is causing you grief. And by better I mean more mature, more understanding, and more willing to work on the issue. There's only so much one person can do to change and work on an issue, but if the other party is not doing their bit, the matter won't get solved. So, what to do? First, a story. I used to have a habit to bite my nails. Out of boredom, frustration, or just while thinking. I was completely unaware how disgusting this habit might be for onlookers. Exhibit A. I was in a car with a relative and started biting my nails. He reached forward, grabbed a package of chewing gum and offered one to me. I took it and forgot my nails. We drove on, happily chatting, and I was only vaguely aware that the gum was offered to change my behaviour - more importantly, I didn't mind. Exhibit B. I was on a plane, sitting next to a complete stranger. This person was a much older man, perhaps in his late 50s or early 60s. We were having polite small talk and out of habit, I started biting my nails. This man slapped my hand (softly, of course) and told me sternly: don't do that. I stopped, taken aback. Who are you to tell me what to do? You're not my father, you're a random stranger and you think it's ok to touch me (even if it was partly in jest) and reprimand me like a school kid? Question: which person managed my behaviour better? I still remember both of these situations, years after, and I think about person A warmly because he's a genuinely nice guy - and I actually stopped biting my nails eventually, once I realised it's a habit worth dropping. I also remember person B, but only because I'm still infuriated by him. Who the heck he thought he was? Yes, he was older, he probably was in a higher position at work - he was used to having authority, had his own kids and grandkids, but 1) I immediately thought he must be aggressive because he "slapped" a stranger and 2) I secretly thought I'll do what I please, you can't stop me, no matter what's your "ranking" in life. The lessons I learned were: it's always better to instill an idea than push it with force. Bossing around or giving orders is bound to trigger resistance, annoyance and rebellion. "Well, watch me do as I please!" is an attitude of toddlers, teenagers and grown adults alike, when ordered to do something they don't like or stop doing something they like or are accustomed of doing. Secondly, it's always possible to give feedback in a respectful, understanding and action-oriented manner: there's no need to be rude. I know there are bigger problems in life than nail-biting and I've personally encountered the following: how to change someone who's suicidal, depressed, alcoholic, into drugs and gambling, a world-class procrastinator/the king of lazy; or a selfishly manipulative narcissist (these were not the same person, but a number of people). And... Sometimes you simply can't. If the other person is beyond cooperation and help, the only reasonable action might be to withdraw, cut your losses and cut contact with the person - or, if possible, try to get professional help. Treating addictions or mental disorders shouldn't be done with tarot alone, you'd need health professionals or a support group involved. If not for the other person (if he or she refuses it), but at least for yourself. However, where tarot can help is to give you advice on how to react and behave when dealing with a problem person. Tarot can calm you down with insights like: it's not about you, it's about him/her, it's their issue and their life lesson, you can do X, Y, Z to make this dealing easier, just stay calm, collected and in charge of your own actions and feelings. Don't let anyone push your buttons. If you've heard about, or even better, read the classic book called How to Win Friends and Influence People (Dale Carnegie 1936), you'll know that expectations create actions and behaviour. The thumb rule of this "Golden Book" - as it's called - is: what you expect from others, will influence how you treat them and this in turn influences how they respond and treat you. If you treat others with respect, kind interest and benevolent trust, and in particular, set positive expectations, 99% of people respond accordingly because they want to prove you're right about them. Similarly, low expectations or blaming, nagging and namecalling cause people to under-perform - "well, s/he already thinks I'm a fat, stupid, lazy loser so that's who I am then"-attitude. I think one of the major culprits in any relationship is sinking into a blame-pit where both parties only see the negatives in each other and keep bringing them up either vocally or in their mind. This often leads to a "counting points" situation where each party remembers with absolute clarity all the favours and good deeds they've done for the other, but only keep track on all the negative reactions they've received from the other. This type of biased record-keeping is bound to make the relationship feel imbalanced and eventually explode under what the parties think is gross mistreatment. Another example. I used to have a prickly relationship with one of the managers at work, because I thought she's incompetent and I (subconsciously) kept count on every mistake she made: I also counted lack of action as a mistake (in particular when she didn't communicate something she should have to the team). I eventually had a pile of "evidence" against her and felt pretty acrimonious when having to deal with her. One day, I finally realised she must be struggling under her workload - maybe she simply doesn't realise what she could do better. So, I started giving her compliments. When she did communicate something well, I politely thanked her for keeping everyone in the loop. This one email was a game changer. She replied she never gets acknowledgement and felt great for getting positive feedback for change! And, miraculously, she's started communicating more. Because she figured it will be positively noticed. I've continued using this method with her and other people at work with success. It does seem to work. Because people indeed want to show they are worth the compliments. Now, is this manipulation? I don't think so. It's simply acknowledging the positives and being polite and respectful - being a decent human being and receiving the same back. I live by this rule at home as well and I always thank and compliment my husband for doing the dishes, vacuuming, etc. It might sound like "why should he be complimented for what are his chores?". Well, why not? And now he thanks and compliments me, too, and does his part of the chores on his own without me asking, reminding or nagging. Win-win! 2 How to bring the issue up? 3 The best realistic outcome if I raise the issue? 4 How will the other person behave? 1 Page of Swords - well, the issue is about having mental fun, exploring, playing, feeling excited by a mental challenge, and that clearly is important to this person. So, it needs to be understood and acknowledged - nobody changes their behaviour if they get more out of continuing it than changing or stopping it. Clearly this is an important matter of having fun and stretching one's mental capabilities so now the question should be: is there really a need to change their behaviour? 2 King of Swords - be direct, honest, unemotional, rely on logic: bring up the pros and cons that the playing has on the people around and also the person (lack of exercise etc.). State your point without drama, just lay it out as it is but don't budge from your position, either. 3 Two of Swords - the person will always be of two minds: wants to play, but knows that excess is not beneficial. This seems like an ongoing issue and the person will not be able to decide only one direction (play full-on or not play at all). 4 Seven of Swords - this person will sneak behind everyone's back and most likely play when others are not at home (which is actually fine, so an OK outcome here). 5 Ten of Pentacles - that nothing is threatening the security and stability of their life. The person needs to feel stable, grounded and happy about their life as it is now and having an argument or discussion about gaming will not make this person lose what matters to them (family, home, income etc.). 6 Knight of Swords - the outcome can be a bit of a clash: this Knight is fast, furious and very frank up to the point of being rude. It's best to keep emotions in check when having this discussion (and also after) and stick to the behaviour of the King of Swords: truthful, analytical, structured and solution-oriented. 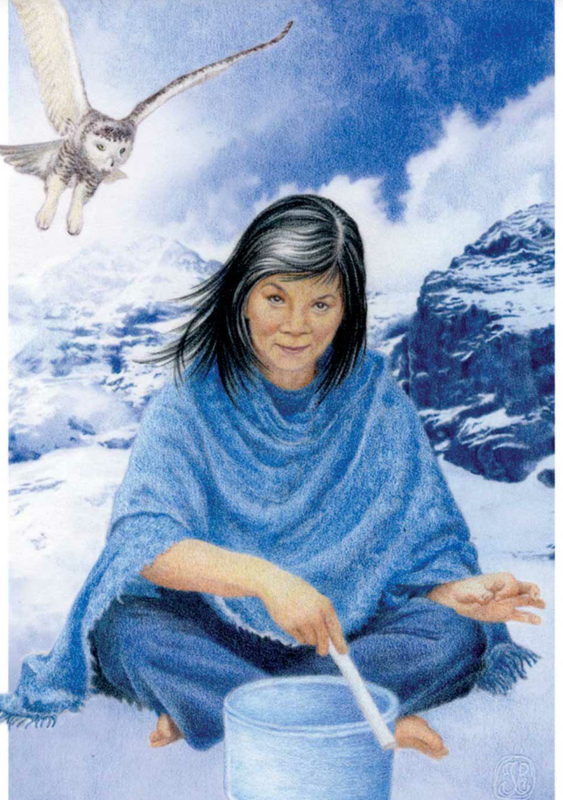 The Queen of Swords (the Guardian of Air, Gaian Tarot) is a person who can manage her (or his) emotions with logic and rational, calm, structured touch. She won't let anyone push her buttons but is wise enough to see beyond others' actions. That's what's needed in changing someone else's behaviour, too. Why negative tarot cards are necessary? New series - how to be happier? Why everyone should have a tarot reading? Is tarot simply wishful thinking?